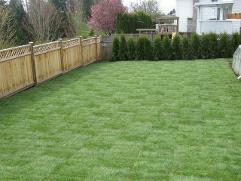 Sometimes aerating, fertilizing and watering are just not enough to get that lush, green lawn so many people desire. Often times a root base can be over come by disease or certain bug species, leaving you in the last resort to start over. Start over and lay fresh sod, which is rolled pieces of cultivated lawn that can be unrolled and, with proper care, take root in the ground. The steps below detail how to take care of freshly laid sod. 1. Whether you choose to have your lawn professionally installed or do it yourself the first step to a healthy new lawn is spreading starter fertilizer, prior to laying the new turf. Our premium 50% slow release nitrogen fertilizer is available for purchase and is rated a top quality product containing a mixture of key elements in order to give your turf the nutrients needed. 2. Once the turf has been laid commence watering immediately. Water your turf for at least 30-40 minutes per zone. If puddling is starting to occur the lawn is getting too much water and the water supply should be reduced if not stopped. 3. Week 1: Water your new turf twice per day in 30 minute intervals. Watering should take place in the early morning hours (6-9) and once the sun is setting (7-10). Inspect the turf by carefully walking on it, if your foot sinks deep the turf is getting too much water and water should be reduced. 4. Week 2-3: Continue to water your growing turf in 30 minute intervals once per day either in the early hours of the day or once the sun begins to set. If you see your lawn is puddling, reduce water. If the lawn is not a rich green colour and is turning brown, apply more water to the specific zones needed. 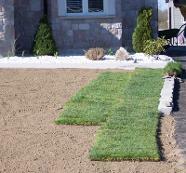 Inspect your lawn by gently pulling on a corner of turf, by this time the turf should be rooting if not rooted. If the turf does not pull up it is rooted as should be. 5. 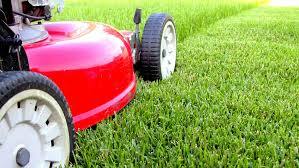 Grass Cutting: The newly installed lawn may be cut after three weeks or after it is 4-5 inches in height. Long-term grass cutting: turf should be cut down no lower than 2-3 inches. 6. Long Term Turf Care: In order to maintain a healthy lawn it should always be watered in 20 minute intervals daily or at least every second day. 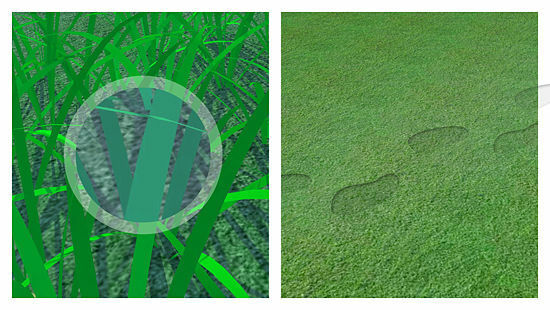 Fertilization is a big step in maintaining healthy turf. Whether you purchase one of our premium fertilization packages or decide to fertilize on your own, fertilization should take place four times throughout the year and five if a weed prevent application is included. Make sure to follow watering and fertilization instructions. Roll your lawn three months after the sod has been laid. Have your lawn aerated yearly. Aeration is the number one thing you can do in order to maintain a healthy lawn. 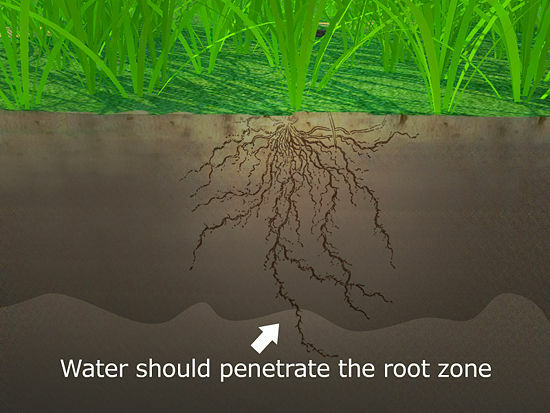 By pulling thousands and thousands of plugs from the base of your lawn, the roots are able to get water and air, creating new gross growth and allowing your turf to continue to prevail in a thick rich fashion. Water only when your grass needs it. Water conservation isn't the only reason to limit the amount of water you give your lawn. Over-watering is also bad for your lawn's health and can contribute to the development of fungus and disease. Some types of grass require more water than others, and environmental factors such as temperature, humidity, and wind can dramatically affect how frequently you need to water your lawn. Fortunately, the most accurate way to determine whether your lawn needs water is also the easiest: just look at the grass.